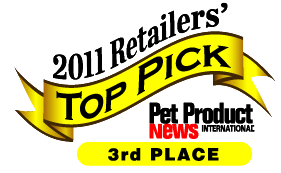 We are honoured to learn that our Tidy Feeder has won one of Pet Product News International’s Retailers’ Top Pick Awards. The innovative Tidy Feeder hay package received the third highest vote count in the Small Animal Products Category. The Tidy Feeder is a new packaging for hay, that lets pet owners feed top quality hay while reducing the mess, waste, and effort, that comes from feeding hay by hand from a plastic bag. The product converts from a store display box into a hangable feeder that’s safe for pets to chew on and can be recycled once the contents have been consumed. Dunlea Farms Pet Hay offers three varieties of hay in the Tidy Feeder package – Timothy Hay for Adult Pets, Timothy & Alfalfa Mixed Hay for Weaning, and Alfalfa Hay for Baby Pets. The Tidy Feeder also comes in two sizes, 12oz and 24oz, to suit every pet and cage. Dunlea Farms Pet Hay creates natural farm-based pet products that are good for people and their pets. You can learn more about our products here.